Part of a gated community, the Beachwalk Isles homes are 5 miles from the beaches of Fort Myers, Florida. It features a fully-equipped kitchen and multiple bathrooms. Only a short drive from Orlando's most popular area attractions, including Walt Disney World, this hotel features comfortable accommodations, complete with everything needed for an enjoyable stay. Located in Key West, Florida, only a short distance from beautiful beaches and the city centre, this resort offers spacious, completely non-smoking accommodations along with many thoughtful amenities. 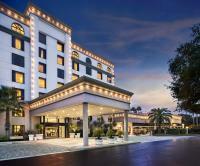 This Orlando, Florida hotel provides a free shuttle to and from the Orlando International Airport. The hotel offers a daily breakfast. Free high-speed internet access is available in the rooms. This hotel is an all-suite property 3 minutes' drive from the Walt Disney World Resort. Guests can enjoy free local area transfer service to Walt Disney World Resort theme parks, an outdoor pool, and full hot breakfast buffet.